W/reinforced polythylene floor, full zippered nylon mesh front door w/storm flaps, large nylon mesh rear window. 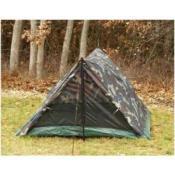 Includes aluminum poles, stakes, rope, nylon stuffsack 84" x 60" x 36". Weight: 3lbs. 8oz.